Searching for inexpensive table runner ideas? 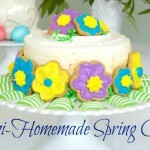 Especially ones for your Spring decor and Easter tablescape?You are in luck! 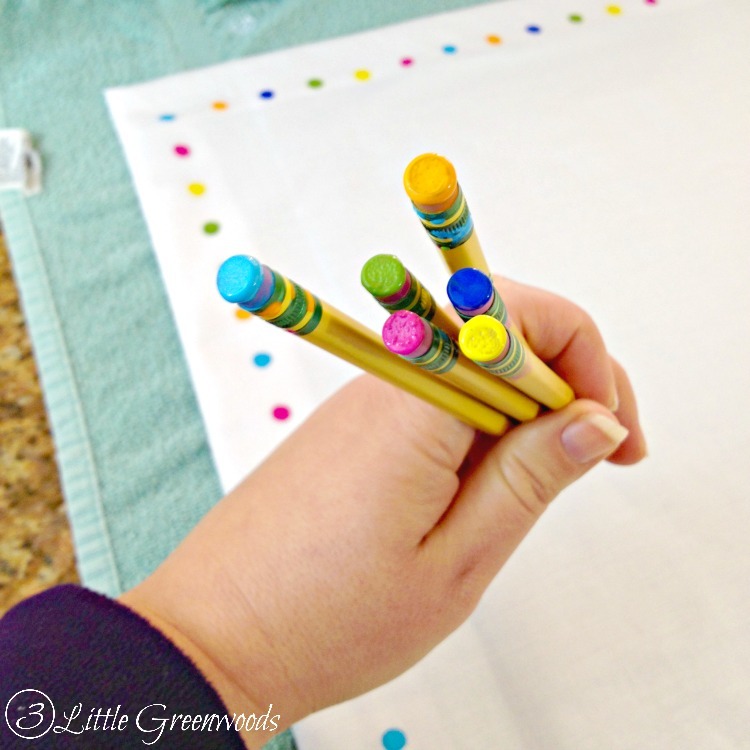 I’m sharing how to make a No Sew Table Runner that is perfect for Spring holidays! Hold on to your Pottery Barn catalog because I’ve got a knock off that is going to amaze you! My entire thrifty table setting for Easter was inspired by a recent visit to a Pottery Barn store. I fell in love with their elegant and colorful tablescape. But the piece that first caught my eye was an embroidered dot table runner. I knew immediately that I could make a perfect match for way less than the Pottery Barn price tag! 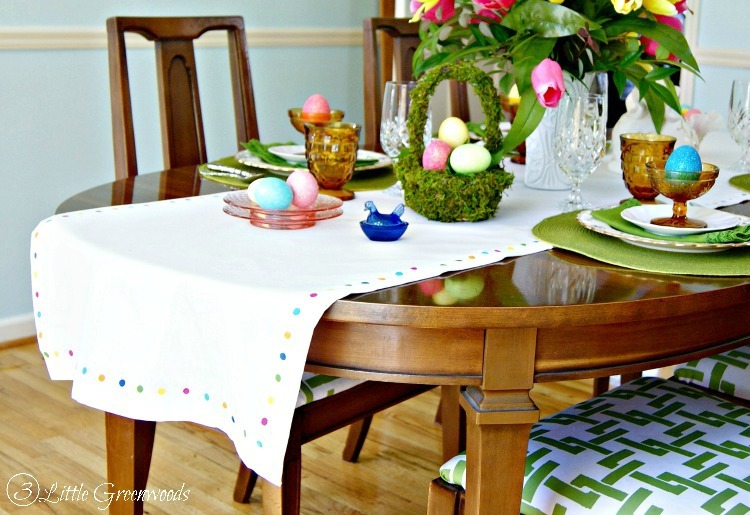 A No Sew Table Runner for Easter lays a wonderful foundation for my traditional holiday table. It is a DIY project that’s created from craft store supplies. 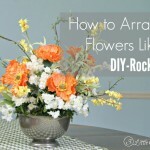 It is simple to make and super inexpensive! This post contains affiliate links. Click here to see my complete disclosure policy. 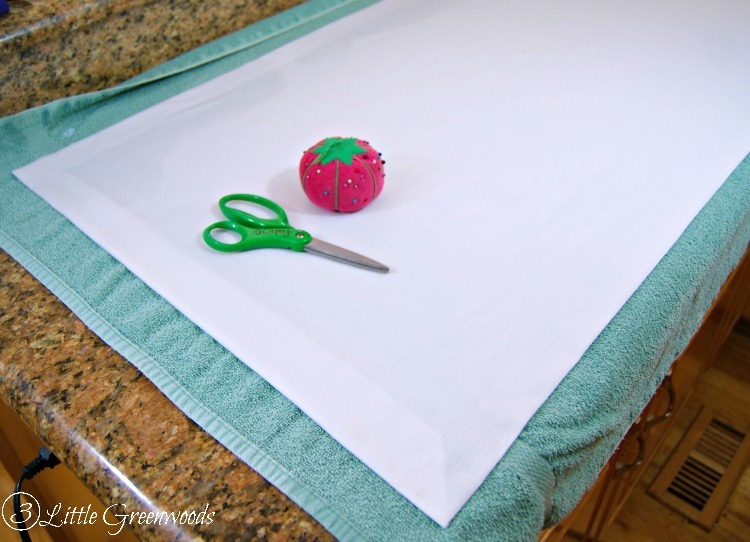 Before beginning the diy table runner decide how long you would like for it to be. Our dining room table is average size and seats six. The perfect length for my runner was 2 1/2 yards long. Without unfolding the fabric iron the piece completely. I chose white batiste fabric. Leaving the fabric folded gives the table runner more weight. Pay special attention to the folded edge as you iron. Make sure that edge is crisp. Miter the corners to create a clean look. Follow all instruction on the fusible bonding tape package. After the fusible webbing has cooled it’s time to have fun with craft paint! The paint colors I selected closely match the embroidered dot on the original Pottery Barn table runner: hot pink, robin egg blue, orange, indigo blue, sunny yellow, and grass green. Brand new pencil erasers made wonderful tools for perfect little dots. 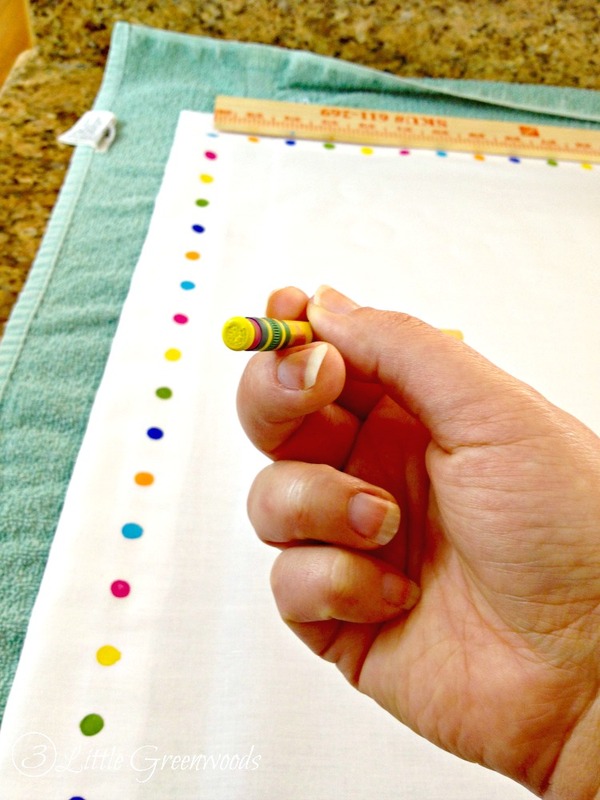 Line up a ruler or measuring tape one inch away from the edge and begin a dot pattern with the paint. Place each paint dot at one inch intervals. Allow each painted side to dry completely before moving to the next section. Continue the dot pattern all the way around the table runner. I could not be more pleased with the results! 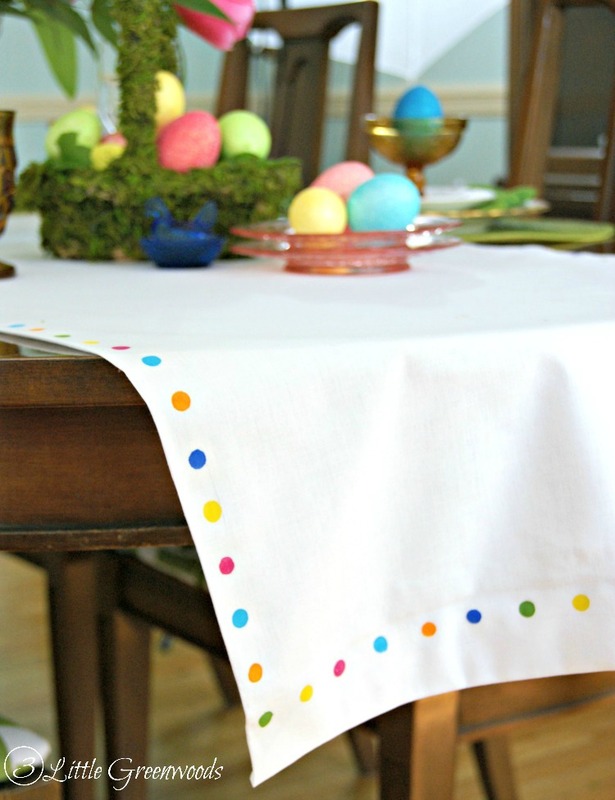 This Easter table runner brings all the piece of our traditional Easter table together. 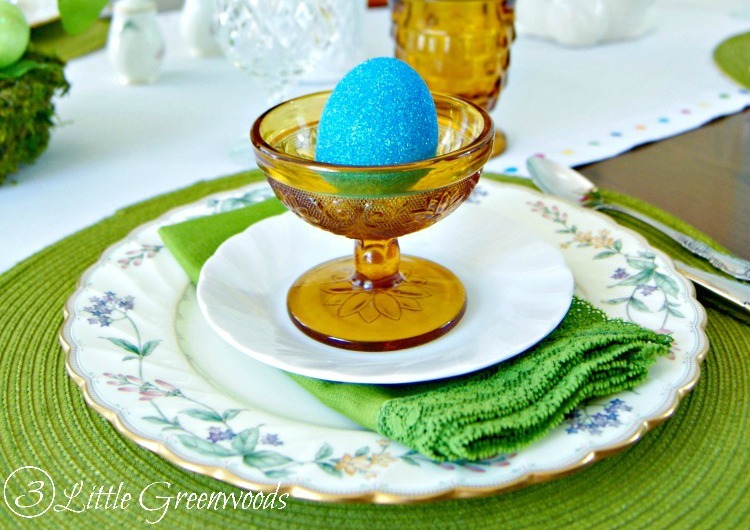 The little dots add a bit of whimsey to the table setting and the colors echo the brightly colored eggs in the moss covered basket. This entire project cost less than $10. That is way less than the Pottery Barn price tag. 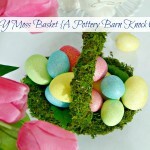 If you love this DIY table runner for Easter then you must see the Moss Covered Basket I created. 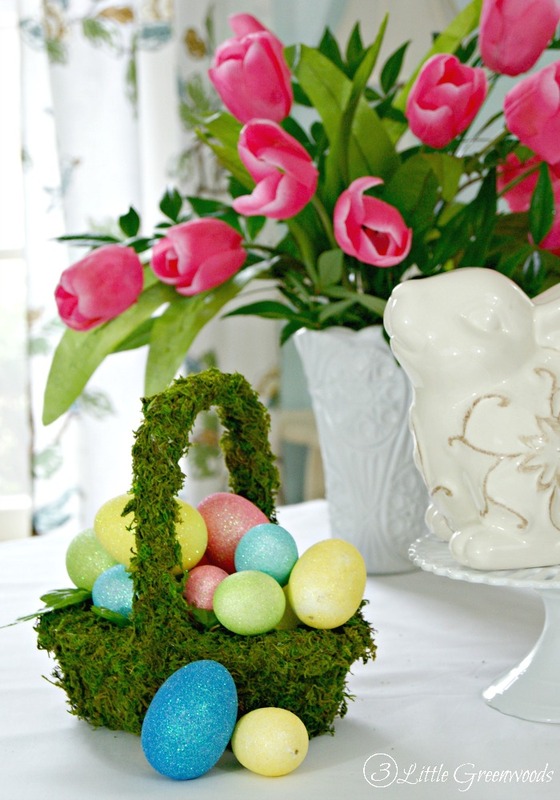 Search for more Easter tablescape ideas? 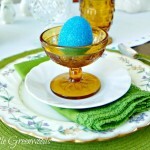 Click here to see my thrifty table setting for Easter. I hope you have been inspired to brighten up your Easter table with a Spring Table Runner of your own! This is so cute! I love that you found something you loved and went home and made your own!!!! Love this Ashley! Love the pencil erasers for a paint brush. It’s the perfect dot! I know right? Pencils make the perfect dot! Thanks so much for the comment love, Laura! Thanks so much for the pin love! You definitely should make one of these table runners. It was super easy and quick! I love how easy this looks! It’s so cute on your lovely table. Thank you so much, Rebekah! It was a very easy project to make. Aren’t those are favorites? Oh that is a great idea! A Christmas themed table runner with red and green would be pretty too! This is too cute! And how simple! I love simple. It adds just the perfect amount to color to the runner. I love the little polka dots! They are so happy! Thanks for the blog love! Thanks so much, Nina! It really is pretty on our Easter table! This is really cute! Love the spring colors. YAY for Spring! Hope you had a wonderful Easter with your family! This is so cute, I love how that is made. Thanks so much, Candi! 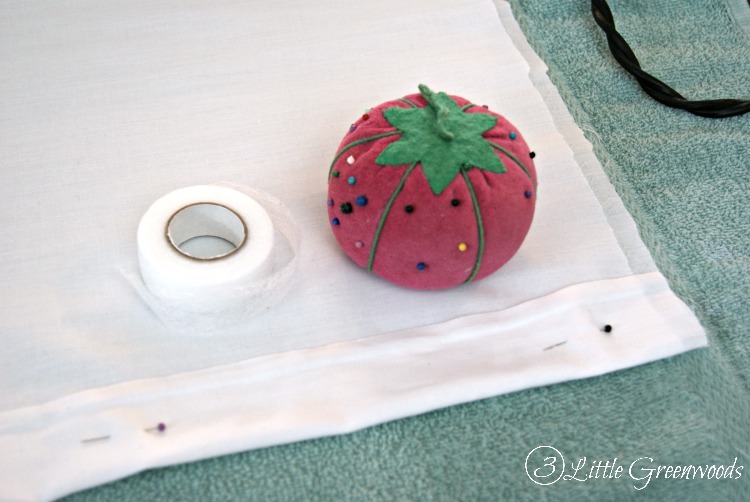 Since I am scared of my sewing machine no-sew is my favorite way to create! The table cloth is so cute. I love the colors and it looks so easy! Pinning this! Absolutely ADORABLE!!! Yay for no sew!! Happily pinned! Thank you SO much for the sweet comment and the pin! Happy Easter! YAY for starting your own blog! It’s hard work but if you have a passion for sharing your creativity blogging is a wonderful thing! I hope you were able to create your own table runner for Easter! I love this! I’m behind on Easter decorations, and I was considering skipping over it all together. I may have to set aside some time to tackle this though, because it’s adorable! Aww thank you so much!I hope you had a wonderful Easter with your family! I love to sew, but I also love a great no-sew project. This table runner is so adorable! And I love the pencil eraser idea. 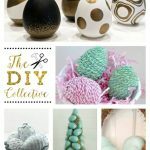 This looks so lovely and colorful PLUS it’s easy to do…I think I could actually handle this DIY and I am so not crafty! Thanks so much for sharing. Finally a “sewing” project I can do!! I can’t even sew a button on–so this is perfect for me! I can sew buttons but that’s it! I love no-sew making anything! I’m in love with your no-sew table runner, especially because I can’t sew at all! My brand new sewing machine just sits by it’s lonely self. 🙂 Not only is it the perfect table runner for Easter, but it could be displayed throughout summer, too. I do love a good Pottery Barn knockoff. Your no sew runner is so cute – the only time I use my sewing machine is on paper! 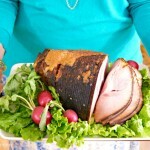 I love that it is not specific to Easter and it can be used at other times of the year! You sew paper?! That is too funny! I bet you make some awesome paper crafts though! How adorable! You are so crafty and quite good at making things affordable…that’s what most mom’s hope to be, is thrifty!! 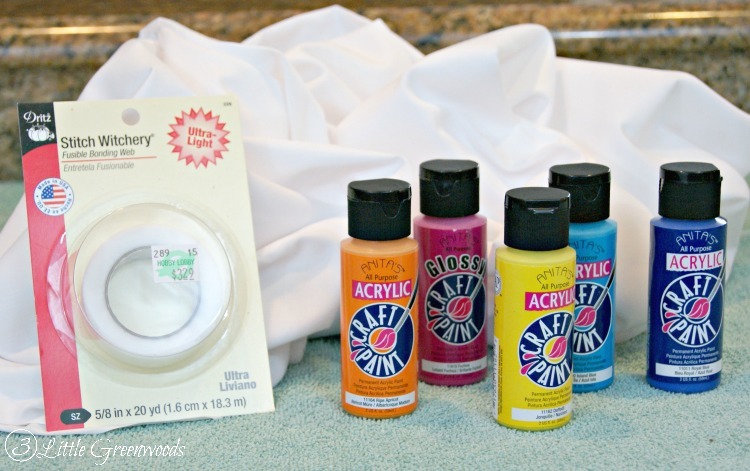 Thanks for sharing, I never learned to sew and have wanted to, but this is a way to allow me to be crafty without the worry of messing something up. I used to think I was crafty, but since I’ve had kids that part of my brain seems to have gone to sleep! This table runner is definitely something I could do. Thanks for sharing! Yep! Children have a way of draining the creativity and energy out of all of us! 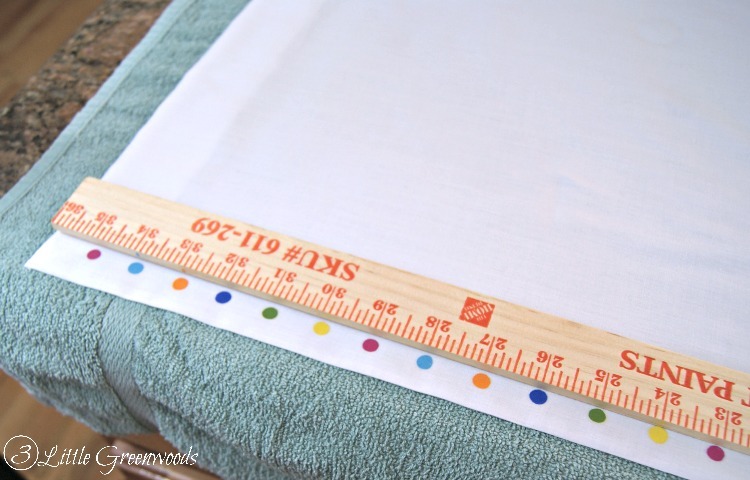 I really hope you give this DIY table runner a try. It is so simple and gives any table some WOW! So cute! That is perfect for spring in general! This is ADORABLE!! I need to make this to “brighten” up my table! Thanks so much, Tiffany! 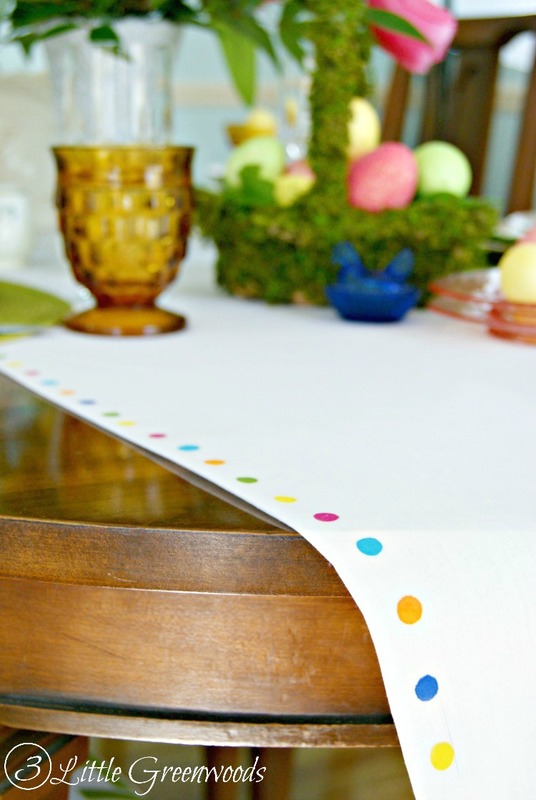 I’m so excited that you like my little PB inspired Easter table runner! This table runner is so cute! I love polka dots and the fun pops of color. This will be a great project I could make with my daughter! Wonderful idea to make one with your daughter! I know Tootsie, our four year old, would love to help me make one too! I love everything about this!! So simple and SOOOO CUTE! 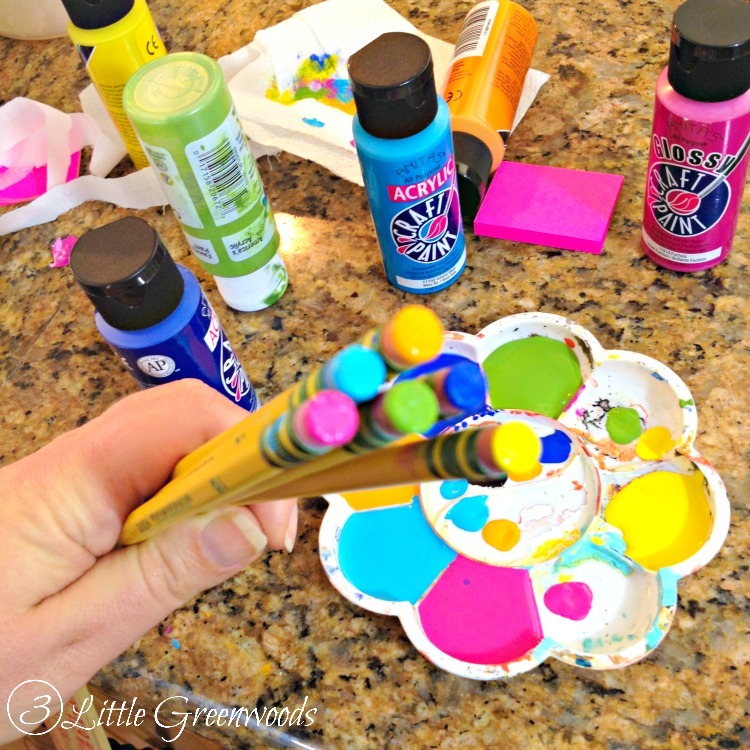 Thanks for sharing at the Frugal Crafty Link party! Thanks so much for the sweet comment and for hosting your fun party!